Do you use Elizabeth Arden Eight Hour Cream ? Have you looked at or purchased anything from the new Eight Hour range? I remember well, being introduced to this cream,right back in the eighties a friend of mine gave me a book to read. The book was of course about beauty, all I wanted to read about was either fashion, beauty or hairdressing. I was doing my City and Guilds hairdressing diploma at this time, and my brain was like a sponge soaking it all up. Anyway, the book was an auto biography by Britt Ekland (remember Britt ? ) All about her beauty routine and advise on how to look good. It was here I read about Eight Hour Cream Britt highly recommended the cream, so I went strait out and bought some. I’ve never looked back, that tube of cream has been used everyday since. What I use it mostly for is my lips. I have been quite lucky so far in the ageing department round the lips, and I’m sure this cream has played a big part in keeping the lines at bay. It’s really good for cuticles and any dry skin area, I use it on my heels too. I have never had dry lips, this makes a big difference to applying your lipstick. So when I heard that a new range of Eight Hour products were being launched I knew I had to go see for myself . The new Eight Hour Miracle Oil is amazing, I have been trying out a couple of samples of this. It can be used literally anywhere on your body, even to tame frizzy hair. I have been using mine for a few weeks incorporated into my weekly facial. Once I’ve given myself a cleanse and exfoliation, I put a couple of drops into my palms then massage into my face and neck. You can feel it being sucked in! It really hydrates and plumps my skin up. This will be great for getting my body ready to be on show in the summer prior to tanning too. again a good body exfoliation followed by a helping of this miracle oil. Have you tried any cleansing oils yet? I was not sold on the idea at first and this is my first try. A few drops in the hand, a few drops of water, massage into your face and then rinse off. Hey presto! make up gone, mascara gone, and no oily residue (This is what I was expecting) Just super smooth clean skin. The oil contains natural ingredients so this will be great for sensitive skins too. This entitles you to 15% off the value of £75.00 (threshold) This offer is available till June. If you already use any of these products or buy some , let me know what you think , What’s your favourite ? 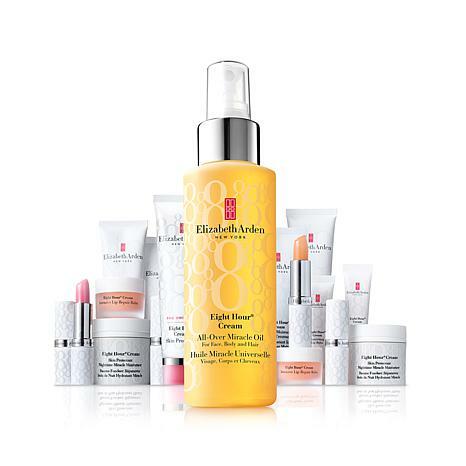 I am a huge fan of about Elizabeth Arden products and this was great to read! I haven't used Elizabeth Arden products for a few years however you have piqued my interest and I'm going to take a closer look at the products you have reviewed. Thank you for sharing with us at #OvertheMoon. I think the 8 Hour Miracle Oil sounds like something I would like to give a try. Thanks for the info. Thanks for linking up with Fabulous Friday! Hope to see you back next week. I've been curious about it, but I'm pretty loyal to Strivectin. I've not tried cleansing oil, but it does sound pretty fabulous!